Oracle Sponsors Bio-Intensive Garden & Food Forest for Anihan Technical School | FEED, Inc.
28 April 2018, Ayala Greenfields Estate, Calamba, Laguna. 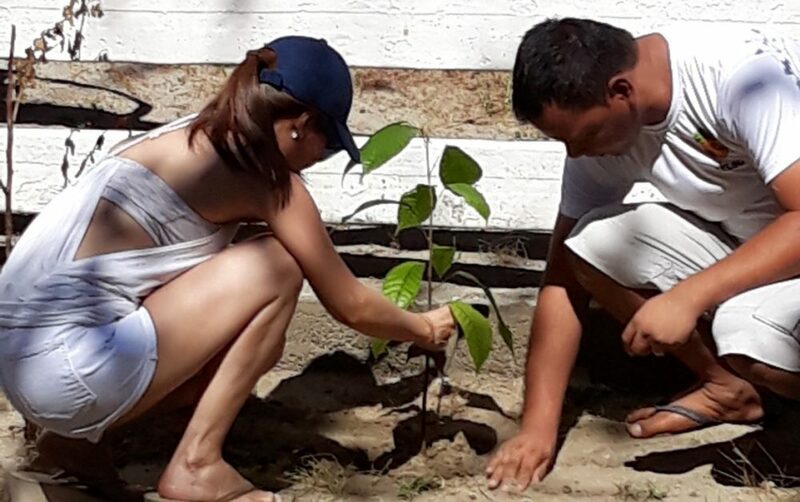 On the 28th of April, 42 Oracle Philippines (Calamba) volunteers and their guests sponsored a Bio-Intensive Garden (BIG) Training of Trainers (TOT), for the benefit of the Anihan Technical School, a technical-vocational institute (est. 1986) and non-profit organization promoting lifelong development for women. Offering culinary scholarships for financially-challenged young women, Anihan also received the seed of the FEED-ANIHAN scholarship fund on the same day, receiving Oracle Philippines’ PHP12,500 initial contribution. Anihan also received the tools and seeds and cuttings donation thanks to ORACLE Philippines, now empowered with the knowledge of how to establish their own food garden on campus. Oracle Volunteers learned about agroforestry, food forests, & edible gardens for environmental sustainability, and contributed in the planting of various seedlings at the Ayala Greenfields Estate. The event was a successful collaboration between FEED, University of the Philippines Los Baños (UPLB), the International Institute for Rural Reconstruction (IIRR), and Ayala Greenfields Estate (A.G.E.) – all of which worked together for the benefit of the Anihan and the community at large. AGE provided the land on which to demonstrate the training and bio-intensive garden (BIG), where the AGE gardeners and Oracle team members were all trained in nursery establishment, bagging of seedlings/cuttings, vegetable garden site preparation and planting. “The toughest part of planting is the maintenance, as organic vegetables require a different type of care compared to native Philippine forest trees – but they all need the attention in their growth years of course“, commented Forester Reynaldo Lorida from UPLB. Thank you ORACLE PHILIPPINES for helping establish an integrated school nutrition source for Anihan and the Laguna community! Anihan’s Two-Year Scholarship Course in Food Service is now a SENIOR HIGH SCHOOL (SHS) TECH-VOC TRACK PROGRAM approved by the Department of Education. It is the same high-quality skills training that the Food Service Industry Partners have come to expect from Anihan plus the full senior high school curriculum. Anihan scholarship grants are given to financially challenged female Grade 10 completers between 16 to 19 years old. With the two-year scholarship grant from Anihan, these young women are guaranteed immediate employment after graduating from Anihan’s Senior High School (SHS) tech-voc track program. Their SHS credentials also equip them to start their own micro-business or proceed to college, if they wish to do so afterwards. There are now more than 1,000 Anihan graduates. They are employed in Anihan’s industry partners such as The Marriott Hotel, The Palms Country Club, Tagaytay Highlands, Taal Vista Hotel, The Bellevue Manila, Sta. Elena Golf Club, Timberland Nature and Sports Club, Vivere Suites, Amici, Conti’s Pastry Shop and Restaurant, Cravings Bakeshop and Restaurant, Cupcakes by Sonja, Dalcielo, Hans Gourmet, Hap Chan, Good Earth Tea Room, Jollibee, Makiling Conference Center, Max’s Restaurant, Mernel’s Place, Purple Oven, Pizza Hut, Red Ribbon Bakeshop, Tagaytay Conference Center, Wildflour, and more. Anihan’s full-tuition scholarship grants to 100 to120 young women is made possible year after year through the sales of its Anihan Goodies, as well as the assistance of Anihan’s patrons and friends who tirelessly solicit donations and grants from private individuals, companies, and other institutions.